Nutrients: A nutrient can be defined as components that are needed by our body to grow, survive and carry on different daily activities. Our food contains mainly five major kinds of nutrients namely vitamins, minerals, carbohydrates, proteins and fats. Additionally, food also contains water and dietary fibres/roughage and water which are also required by our bodies. Carbohydrates: Carbohydrates main function is providing energy to the body. These are found in our food in the form of sugar and starch i.e. simple and complex carbohydrates. Example It is found in bread, potatoes etc. Simple Carbohydrates: These are also referred to as simple sugars, containing single monosaccharide units and found in natural sources of food i.e. milk, fruits and vegetables. These carbohydrates add certain sweetness to the food. They raise the level of blood glucose quickly but are easier to break down. Complex Carbohydrates: These are also referred to as polysaccharides, meaning they contain hundreds or thousands of such monosaccharide units. These are typically found in wheat grain, white bread, kernel and cakes. They are relatively less sweet than simple carbohydrates and also raise blood glucose level rather slowly. However, these are tougher to break down. Cellulose is present in plant cell wall. It is a complex carbohydrate. Humans cannot digest cellulose. Test for carbohydrates: We can test whether a particular food item contains carbohydrates by pouring 2 to 3 drops of dilute iodine solution on it. If the iodine changes its colour to blue-black, then we can ascertain that the food item does, in fact, contain carbohydrates. Proteins: Proteins performs the very essential function of helping our body grow and repair itself. These are found in food items such as milk, pulses, eggs, meat etc. Foods containing proteins are called ‘body-building’ foods. Test for proteins: To test whether a food item contains proteins, first we need to grind it into a paste or powder form and add 10 drops of water. To this mixture when we add 2 drops of copper sulphate solution and 10 drops of caustic soda solution. After a few minutes, if the mixture turns violet, it is indicative of the presence of protein. Fats: Fats are also responsible for providing energy to our body. In fact, they provide more energy than carbohydrates. The body uses fat as a fuel source. Fats are essential for the absorption of vitamins A, D, E and K in the body. Butter, cheese, oil are all examples of fat-rich foods. Test for fats: To test for fats, take a small quantity of food item and wrap a piece of paper around it and proceed to crush it. After removing the paper, allow it to dry. If you see a film of an oily patch on the paper when holding it against light, it is proof that the food contains fats. Color blindness, night blindness- poor visibility at night. Beriberi-  loss of appetite, loss of weight. Pale skin, lack of RBC, Less stamina and less appetite. Scurvy i.e. gum disease (gingivitis). Rickets and Osteomalacia – weakening and softening of bones. Green leafy vegetables, Soyabean oil. Minerals: Minerals are used by the body to perform various functions like building strong bones, maintaining the heartbeat, making hormones etc. 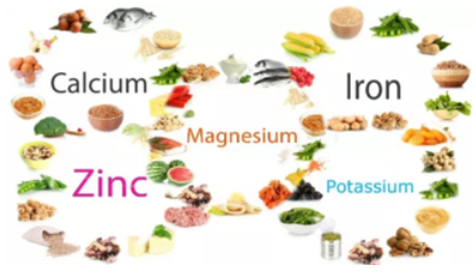 The major five minerals are Calcium, Phosphorus, Magnesium, Sodium and Potassium. Examples of mineral-rich foods include leafy vegetables, fish, beans etc. Goitre- Enlargement of thyroid gland, mental disability. Essential for haemoglobin formation in rbc. Dietary Fibres/Roughage: While dietary fibres do not provide any such nutrition to our bodies but nevertheless are an important component of food. They help in easy absorption of food, helps in movement of bowel and prevents constipation. It helps our body get rid of undigested food. Cereals, fruits and vegetables are some of the roughage rich foods. Water: Water performs the essential function of absorbing nutrients from our food. It also helps in releasing waste from our body in form of sweat and urine. A balanced diet is one that contains a variety of food items providing different types of nutrients in adequate amounts necessary for maintaining good health. The diet should contain a good amount of dietary fibre and water as well. A balanced diet includes a combination of protein-rich pulses, sprouted seeds etc. with combinations of various flours and cereals for carbohydrates and fats along with fruits and vegetables which provide the necessary vitamins and minerals. In addition to making sure that the right amount of food is eaten, it should also be ensured that food is properly cooked so that it does not end up losing its nutrients. Repeated washing of fruits, pulses, rice and vegetables can result in the loss of essential vitamins and minerals. Throwing away excess water which is used for cooking vegetables can result in the loss of considerable amounts of important proteins and minerals present in them. It’s a well-known fact that vitamin C gets destroyed in the heat while cooking. Obesity: Obesity is a medical condition that results from excess intake of fat-rich foods. The excess fat gets accumulated to such an extent that it starts negatively affecting one’s health, well-being and the ability to carry out certain activities. 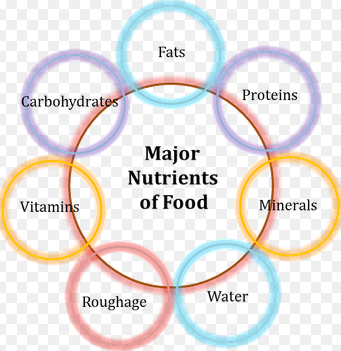 Deficiency: Sometimes simply getting adequate amounts of food might not be enough if the food does not contain the required nutrients in the right amounts. 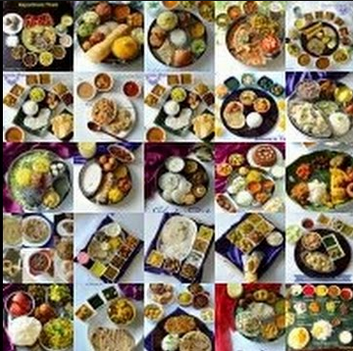 Prolonged usage of such nutrient-less food may result in a condition known as Deficiency. Deficiency Diseases: Diseases that occur from the lack of an element in the diet, usually a particular vitamin or mineral are known as deficiency diseases. A diet lacking proteins may result in skin diseases, stunted growth, diarrhoea, swelling of face and discolouration of hair. A diet deficient in both carbohydrates and protein may hinder the growth completely and the person becomes so frail and lean that he or she might not even be able to move. Deficiency of certain vitamins and minerals can cause diseases like scurvy, goitre, anaemia etc. as mentioned in the tables above. Hence one must always make sure to include all nutrients in their food and drink a good amount of water to maintain a healthy body that is free from diseases. Improper intake of nutrient-rich food may lead to another condition called malnutrition or undernutrition. Without adequate intake of food, our bones become brittle, our muscles weaken and our thinking becomes foggy. In such situations, our bodies are said to become malnourished. When there is lack of protein in our bodies, repair of wounds and an injury becomes difficult. When this is combined with inadequate intake of calories, it leads to a condition known as Protein-energy Undernutrition or malnutrition. Kwashiorkor: People with severe protein deficiency are often at high risk of developing this disease. People in rural areas are more likely to suffer from this disease, as there is lack of protein rich food. If one often indulges in diets that are high on carbohydrates and low on protein it can lead to them showing symptoms of kwashiorkor i.e. Edema (puffy appearance due to retention of fluid), inability to gain weight and bulging of abdomen. Marasmus: Children and young adults are more likely to develop this disease. If there is inadequate intake of both energy and protein, it tends to manifest as marasmus. Chronic diarrhoea, weight loss, dehydration and stomach shrinkage are the major symptoms of marasmus.